Pod does card tricks to prove he's in control. Flaco is rich and loyal beyond words to his abuelo. Manny is desperate to get out of his Bar Mitzvah. Together, what these middle-school misfits want most is for their fledgling band to get noticed. When their made-up song conjures a strange man in Pod's ancient barn, fame follows so fast it's scary. As strange things spew from Pod's guitar, the boys in the band wonder how much of their success comes from talent and how much comes from a dark power they don't understand. What will they risk for stardom? A gangster look-alike named Fred convinces them they've made a deal with the devil-their souls swapped for a chance at fame. But once they nail a spot in the Battleband competition, each of the boys has his own reasons for wanting to win. Pod struggles to control his world since his mother disappeared. Flaco's abuelo is elderly and ill, and Manny longs for acceptance by the school's jocks. As rising Battleband stars, they ascend from seeming invisibility to sudden popularity. The stakes rise when Fred, acting as their agent, snags a chance for their band, Fly, to open for a famous group called Seventh Circle. Complicating their struggles are conflicts with one another, their vacillating relationships at school, and family problems. But when Fred threatens the people they love and his Big Boss wants them to sing a disturbing song about suicide, the boys know they can't let their band be used as an instrument of destruction. With the help of their school librarian, they find problems with Fred's "contract." But will it be enough to save them? In this first book of the Battleband Saga (www.battlebandsaga.com), acclaimed children's novelists Gail Giles and Deb Vanasse team up in an adventure of music, magic, and myth that puts a fresh spin on a timeless tale for young readers. A colorful cast, complex emotions, lively wording, rich allusions, evocative imagery, and multiple layers of meaning add appeal for all ages. "Brilliant and strikingly new " says Terry Trueman, Printz Honor Author of Stuck in Neutral. "You'll be hard-pressed to find three greater kids to root for in this fight against the devil." Hunchback Assignments author Arthur Slade says, "Turn this book up to eleven It puts the buzz in Beelzebub and the power in power chords." 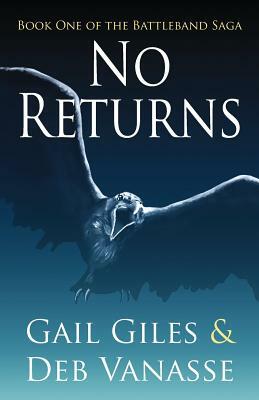 Kirkus Reviews calls No Returns "the first movement in an ambitious song cycle of a tale.